Tom Jung Photography: Out! Out D#&% Spot! This is a photograph of the LCD display on my Nikon CoolPix A camera. You can see, near the top edge of the image, the shadow of an enormous dust spot. It is so big (and bad) that it is clearly visibly on the screen. What makes this unusual is the CoolPix A is a fixed lens super Point-And-Shoot, and one would have assumed that the camera was assembled in a clean-room environment. The camera is currently at the repair depot, patiently waiting for a technician to exorcize this unwanted intruder. 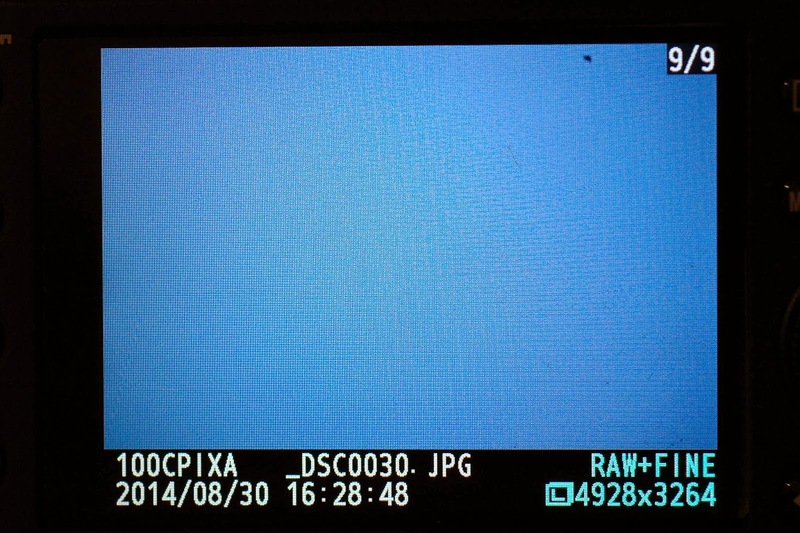 Dust on the camera's sensor (or in most cases, the low-pass filter) is a nuisance as inescapable as death and taxes. This situation is exacerbated by the very nature of digital photography. First, the decreased size of the APS sized sensor found in most amateur and prosumer digital single lens reflex (DSLR) bodies makes any tiny bit of airborne flotsam so much larger in proportion, just as dust became an issue when photographers went from large format roll film to the 35mm format. Also, the electronic nature of the sensor itself tends to attract dust due its normally electronically charged state. Set your camera's ISO to 200, the lowest most cameras go. Set the camera to Aperture Priority. 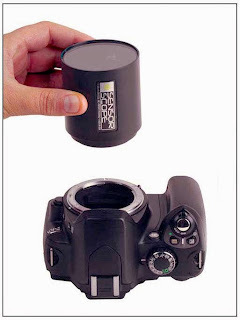 Set your lens aperture to F16, or the lowest setting (smallest aperture) you can. Set your focus to Manual. You see why in a moment. Point your camera skyward and locate a clear area of blue sky. Be careful that there are no flying birds or airplanes within the frame, as you might mistake them for dust that isn't there. Take a shot. If you didn't set the focus to Manual, the camera will try, in vain, to find something to focus on. Don't worry about the lengthy exposure times - the shadows of the dust particles are on the sensor and not affected by movements made during the exposure. Enter the Preview Mode, and zoom in on the image as far/close as you can. Move the viewing frame to the upper left hand corner, and using the mulch-directional control, scan the image from left to right, top to bottom. If there is any dust on the sensor, you see it move past as you scroll. In this photo, you can see the spot and its approximate location near the edge of the sensor. At this point, you can use your Rocket Blaster to attempt to blow the particle away. Do NOT use compressed air, as the air stream may be strong enough to damage the lo-pass filter or the sensor, depending on your camera's design. Dealing with dust is just a fact of life, but if you're an available light shooter working with more open apertures, you may never notice the presence of these tiny intruders. You may also tell yourself that cloning out a single speck of dust is not a big issue, but if you ever have to make two hundred identical photographs on a clean white background, that little retouching exercise will get pretty tiring after the first dozen. 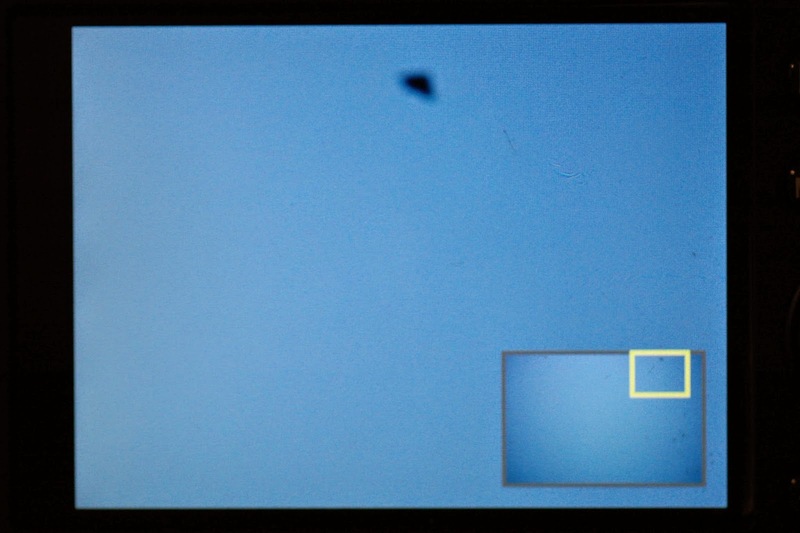 Incidentally this specimen on my Coolpix A is the biggest dust spot I can remember. I'll be happy when it's removed.